Fifteen different species of rabbits and hares live throughout North America. This post comes to us from the folks at Camo Trading, who carry a wide range of camouflage home decor, bedding, and apparel. Rabbits and hares have colonized virtually every habitat. Aside from several shared traits, such as large ears, long legs and herbivorous food habits, each has evolved a suite of adaptations that allow it to survive in its native land. Pygmy rabbits are a small species, native to most of the Great Basin states. Inhabiting sagebrush-dominated habitats, pygmy rabbits form "tunnels" through the vegetation, which provides them with safe passage. Additionally, pygmy rabbits dig and use small burrows, from which they never travel very far. In the winter, cold temperatures force these small rabbits to spend much of their time deep in these burrows, to avoid hypothermia. 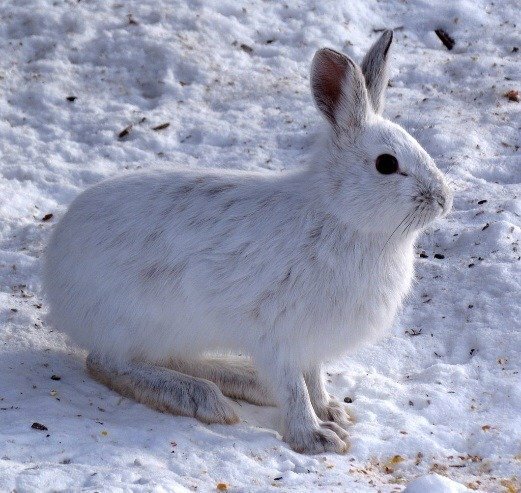 Snowshoe hares are the smallest hares in North America. Clad in white fur during the winter, snowshoe hares become brown in the summer, which gives them the best possible camouflage in each season. The relatively small ears of these hares help them reduce the amount of heat they lose to the environment, thereby keeping the tiny rabbits warm. Additionally, snowshoe hares have very long, fur-covered feet, which help them walk across the snow comfortably. Arctic hares are native to the tundras and flat coastal areas of Greenland and Northern Canada. Due to the relatively short summer seasons of their native lands, arctic hares only produce one or two litters each year. To offset this disadvantage, snowshoe hares produce larger litters than other hares do; instead of producing litters of two to four young, snowshoe hare litters contain up to eight young. Also called desert hares, black-tailed jackrabbits are relatively large, weighing up to about six pounds. Like all other hares, newborn hares are precocial, meaning that they are born with their eyes open and the ability to run within hours of birth. Living throughout much of the Southwestern United States and parts of Mexico, these brown and black jackrabbits can thrive in many different habitats. They rarely rely on burrows, instead, relying on shrubs and plants to hide from predators. Alaskan hares are indigenous to Alaska. Large rabbits, Alaskan hares often weigh up to 11 pounds, making them one of the largest hare species in the world. Despite their large size, Alaskan hares have very small ears, which prevent excessive heat loss in their cold habitats. Because of the short summer seasons characteristic of their snow-covered home lands, Alaskan hares only have time to produce one litter each year. Primarily clad in brown and gray tones, white-tailed jackrabbits get their name from their conspicuous, white tails. Native to the Western and Midwestern portions of the United States and Canada, white-tailed jackrabbits are most active at night--an adaptation that helps them avoid birds of prey. White-tailed jackrabbits consume a wide variety of herbaceous plants, twigs, bark and fruit. Native to Arizona and parts of Mexico, antelope jackrabbits are some of the largest wild rabbit species in the world, with large specimens weighing as much as 10 pounds. Antelope jackrabbits have large, nearly naked ears, which provide them with exceptional hearing. These large ears help to keep the rabbits from overheating--an important adaptation for these desert-dwelling creatures. Swamp rabbits are small bunnies, native to swamps, wetlands and other aquatic habitats of the southern United States. Swamp rabbits remain relatively small, and most weigh only four or five pounds. Swamp rabbits rely on their cryptic colors to avoid a wide variety of predators lurking in their native habitats, including coyotes, hawks, owls, alligators and humans. Desert cottontails live throughout the Central and Midwestern portions of North America. Desert cottontails often form dense colonies, and are among the most sociable rabbits in North America. Because they rely on their sense of hearing to detect approaching predators, desert cottontails rarely move about on windy days, when it is difficult to hear. Brush rabbits live along the western coast of the United States, from Oregon to Mexico. Inhabitants of the chaparral ecosystem, brush rabbits spend most of the day hiding amid the vegetation, only emerging to forage for food under the cover of darkness. Unlike most other members of the cottontail group, brush rabbits have gray tails. Brush rabbits are rather small, rarely exceeding two pounds in weight. The eastern cottontail rabbit inhabits most of the Eastern and Central United States, as well as portions of Canada. Weighing about three or four pounds, eastern cottontails have gray or brown fur, aside from their namesake, white-colored, tails. Eastern cottontails consume a wide variety of foods, including bark, herbaceous plants, twigs, fruit, root vegetables and flowers. The mountain cottontail--so named for its range, which lies in and around the Rocky Mountains--is native to the Western United States and parts of Canada. Mountain cottontail litters contain up to seven young, which are born without fur. Mothers nurse the young for several weeks before they can exit the den and forage for themselves. As their name implies, these rabbits live amid the Appalachian Mountains. Unfortunately, because their native habitats have been fragmented, Appalachian cottontail populations are declining. These multi-colored rabbits often display a mix of red, brown, gray, white and black fur. Appalachian cottontails are relatively small, seldom exceeding three pounds in weight. Living along the coastal plain of the Southeastern United States, marsh rabbits are small animals, weighing about two pounds. As their name suggests, marsh rabbits primarily inhabit semi-aquatic habitats, such as wetlands and mangrove swamps. If cornered or pursued by a predator, marsh rabbits will take to the water and swim to safety. The New England cottontail is native to the Northeastern United States. Unlike many other rabbit species, which can thrive in a diverse array of habitats, New England cottontails are habitat specialists, who prefer living in the tangled undergrowth of early successional forests.